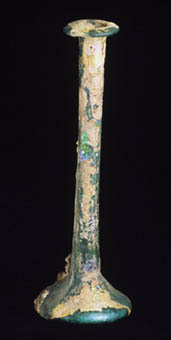 Many Roman glass vessels appear to shimmer with color like a peacock's tail; others, at first glance, look as if they are covered with patches of gold foil. Neither of these effects were deliberately produced by a Roman glassworker. Instead they result from a gradual weathering that glass undergoes when it is buried for a long period in damp soil.